is an exciting, action-packed program designed for councils to provide adult members with leadership skills and experience they can use in their Scouting positions and in other situations demanding leadership of self and others. 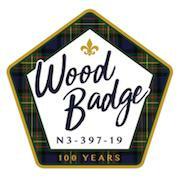 The next Seneca Waterways Wood Badge course will be held May 17-19, 2019 and June 8-10, 2019. Both weekends must be attended in order to complete the course. Contact woodbadge@senecawaterways.org for more information about the course!